External Affairs Minister SM Krishna today asked Pakistan to join hands with India to ensure that terrorism was eliminated from the region instead of combating the menace on a selective basis. “They (Pakistan) should come out and declare a war on terror which should be across the board and not on a selective basis since they claim they are also a victim of terrorism,” he said at a breakfast meeting with the media here. With the Manmohan Singh Government expected to undertake a reshuffle of the Union Council of Ministers, the demand that Congress General Secretary Rahul Gandhi join the Government has come to the fore. IIT Senates have more or less agreed to the new formulation of the common engineering entrance test which the IIT Council decided today. The only formality that remains to be completed now is - formal ratification of the proposal by the Senate of each IIT. Guwahati, June 27 Assam’s flood scene worsened today with 10 more persons being washed away, as many feared drowned and thousands rendered homeless across the state. The world's biggest inhabited river island Majuli is facing a threat of complete submergence. Officials said 10 persons were washed away in Sonitpur and Jorhat districts today and put the toll at 20 in the floods that have affected 23 of the total 27 districts following incessant rains during the past few weeks. Three members of a family were killed and one injured when their house caved in due to a landslide in the Dhirenpara area of Guwahati city on Tuesday night after a heavy downpour. Helicopters of the Indian Air Force (IAF) today rescued all the 12 persons on board the boat clinic stranded in the Dibang river here. In a major setback to the ruling Samajwadi Party (SP), the Bahujan Samaj Party (BSP) has managed to block a Bill doing away with reservation for Scheduled Castes and Scheduled Tribes (SC/ST) in promotions in government service. Problems are mounting for Haryana Board students seeking admission in Delhi University by the hour. Over the past two days, after the university declared its first cut-off list, Haryana Board students are being denied admissions in DU colleges due to lack of their Class XII mark-sheet. The CBI today carried out searches at the residential and official premises of Income Tax Chief Commissioner here in connection with a graft case in which a Joint Commissioner was arrested by the agency. Unhappy over alleged involvement of a Colonel in a recruitment scam at the National Defence Academy (NDA), the Defence Ministry has taken cognisance of the issue and is likely to seek a detailed report from the Integrated Defence Staff (IDS). External Affairs Minister SM Krishna today asked Pakistan to join hands with India to ensure that terrorism was eliminated from the region instead of combating the menace on a selective basis. “They (Pakistan) should come out and declare a war on terror which should be across the board and not on a selective basis since they claim they are also a victim of terrorism,” he said at a breakfast meeting with the media here. On whether the arrest of Abu Jundal, a key plotter of the Mumbai attack, would be taken up by India at the foreign secretary-level talks between the two countries on July 4-5, the minister pointed out that India had always focused attention on terror and terror-related activities at every meeting between the two neighbours. External Affairs Minister SM Krishna is of the view that it is “necessary” for the young Congress leader to make an entry into the Government and help the country solve the problems it is facing. “I am one of those who feel it is necessary for Rahul Gandhi to come into the Government and help in solving the problems that we face as a country,” Krishna said in response to a question during an interaction with media here. In the same breath, he said while the Prime Minister Manmohan Singh’s invitation to Rahul Gandhi to be part of his team stands, the young Congress leader himself appears not too keen on it. “We have always wanted Rahul Gandhi’s involvement in the Government. The Prime Minister’s invitation for him to join is there but he himself seems not quite inclined at the moment,” the senior Minister observed. The final clinching with IITs however happened after days of bitter battle over autonomy between the Senates and HRD Minister Kapil Sibal, who skipped today’s Council meeting to make the point that he never interfered with the process of structuring the common engineering entrance test (CET), which top Indian academics debated and designed from the beginning. Back home, the Minister clarified that the one-test idea was not his own. In fact, the National Policy on Education called for a single test for admission to all technical and professional colleges, the Science Advisory Council to the PM recommended it and so did the Yashpal Committee on Higher Education Reforms. As for CET, the IIT Council had given its first in-principle approval to the idea in September 2011. This was based on recommendations of the committee headed by Secretary, Science, T Ramasami, who suggested a national engineering exam with weightage to state board results normalised on the basis of a percentile formula for admission to engineering institutes. This formula was designed by the Indian Statistical Institute, Kolkata, but the IIT Senates raised objections over its validity, saying the idea of normalisation of marks awarded by different state boards (there are 42) was error-prone and not judicious. They wanted the CET postponed to 2014 and experimenting with the normalisation formula’s efficacy in 2013. “How can you fairly normalise the marks awarded by so many different boards? UP board awards lesser marks. Tamil Nadu board awards more,” IIT Senates asked. The Senates wanted school marks used only for admission eligibility and not for merit rankings. But the Council ignored most of these proposals in its meeting on May 28. The IITs then appealed to the PM for protection of their autonomy. The PM assured support to them and said their “brand” was unique and would be preserved. Assam’s flood scene worsened today with 10 more persons being washed away, as many feared drowned and thousands rendered homeless across the state. The world's biggest inhabited river island Majuli is facing a threat of complete submergence. Officials said 10 persons were washed away in Sonitpur and Jorhat districts today and put the toll at 20 in the floods that have affected 23 of the total 27 districts following incessant rains during the past few weeks. The state government said all districts barring the hill districts of Karbi Anglong, North Cachar Hills, Kokrajhar and Buxa have been affected. The situation is worst in Majuli in Jorhat district which is threatened with complete submergence after the Brahmaputra breached an embankment this morning, sources said. A 70-member National Disaster Response Force (NDRF) team is on way from Kolkata to the island, which house several Vaishnavite monasteries, to help thousands of people stranded there following submergence of 70 villages and complete washing away of 30 others. Road and rail communication to Barak valley in south Assam and neighbouring states of Mizoram, Manipur and Tripura was cut off following landslides in Dima Hasao hill district and Meghalaya, the sources said. In Lakhimpur, over 2 lakh persons have been hit by flood in the Brahmaputra and Subansiri rivers while in neighbouring Dhemaji, over 2.5 lakh persons have been affected. Sources said flood waters have engulfed the entire Kaziranga National Park and animals are crossing NH 37, which passes through the park, to higher grounds in Karbi Anglong hills. The deceased have been identified as Marjina Begum (40), Jebin Islam (13) and Mainu Islam (8) who died on the spot. La Ali (48) who was seriously injured, was shifted to Guwahati Medical College Hospital. This happens to be third landslide tragedy in Guwahati since June 22 and it has taken the death toll to seven. All these incidents occurred at the foot of hillocks that are marked as landslide-prone by the district authority. But people continued to live nearby defying the warning. The Dibang is one of the main channels of the Brahmaputra in eastern Assam. The motorboat had been immobilised after it hit the river’s bottom that had swelled up due to heavy siltation. The boat clinic belongs to the Centre for North-East Studies and Policy Research (C-NES). Ashok Rao, a C-NES programme coordinator, said that the 12 persons, including two doctors, nurses and boat crew, had been stuck in the gushing water near an isle under Amarpur revenue circle in the flood-ravaged Tinsukia district of Assam since June 21. The medical team had gone there to provide treatment to dwellers of Amarpur isle. The rescued persons were brought to the Deputy Commissioner’s office in Tinsukia. The boat clinic was also brought to safety today. While there were foodstuffs on the boat, it had run out of its stock of drinking water. 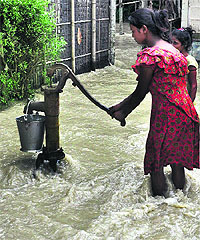 The villagers were providing drinking water to our stranded staff, a C-NES official in Tinsukia said. It is one of the 15 boat clinics operated by the C-NES in Assam under financial assistance from the National Rural Health Mission (NRHM). These boat clinics are an innovative means to reach out to lakhs of residents in numerous inaccessible river isles in the Brahmaputra. After pushing through the Uttar Pradesh Public Service (Promotion for SC, ST and Other Backward Castes) (Amendment) Bill, 2012, in the Vidhan Sabha, the SP government had tabled the Bill in the Upper House, where the BSP still has the numbers. Accusing the SP government of having “anti-Dalit mentality”, Leader of the Opposition in the Vidhan Parishad Naseemudidn Siddiqui questioned whether any survey had been conducted by the government on points raised by the apex court. Leader of the House Ahmad Hasan said there was no provision of reservation in promotion in the Constitution and alleged the law framed by the Mayawati-led BSP government did not exist anywhere in the world. Following the BSP protest, the Bill was referred to a select committee of the Upper House. In 2007, the Mayawati government had amended the government service rules in order to provide reservation in promotions to SC/ST employees. The high court last year scrapped the provision declaring it to be unconstitutional. In April, even the apex court quashed the Mayawati government’s decision. Following the Supreme Court order, the Akhilesh Yadav government had issued an order in May scrapping the provision. It then introduced the Uttar Pradesh Public Service (Promotion for SC, ST and Other Backward Castes) (Amendment) Bill, 2012, which was passed in the Vidhan Sabha earlier this month. This is because, even though their results have been declared, these are only available online and students don't have copies of their certificates. As a result, aspirants from Haryana approaching the colleges without their original mark-sheets and handwritten provisional certificates are being turned down by the colleges. A couple of colleges have given these students a seven-day window to submit their original certificates after which their admissions will stand cancelled. “We get as many as 10 to 20 per cent applicants from Haryana and the same problem arises every year. These students don’t have original papers. The state resident commissioner should bring out a uniform statement and clarify the admission procedure. How hard is it to send the CD results for verification to Delhi University? We cannot give admissions on just Internet photocopies due to the risk of fake mark- sheets,” said Hansraj College Prinicpal BK Kwatra. CBI sources said the agency carried out search operation at the premises of Girdhari Lal Bhagat, Chief Commissioner, Income Tax, here. The case relates to alleged payment of Rs 15 lakh bribe to a Joint Commissioner of Income Tax P W Athalye by businessmen through a middleman at his residence for which he was arrested by the agency on April 27. Athalye, along with his I-T team, had carried out searches at a factory of Raipur-based Khetan group on April 16, the agency sources said. The group is owned by four businessmen, including Arun Khetan and his associate Sapan Khetan. "Three persons acted as middlemen for the accused officials of the Income Tax Department, Raipur, for negotiating, arranging and delivering illegal gratification to Income Tax officials in collusion with the businessmen," CBI said in a statement. The CBI through its sources had come to know that Athalye had allegedly demanded a bribe of Rs 15 lakh from Khetans through middleman O P Singhania at his residence. On Saturday, the CBI had arrested Col Kulbir Singh along with five others for allegedly receiving bribe from candidates during recruitment drive at the National Defence Academy. The Pune-based training institution in under the purview of the tri-services IDS manned by officers from the Army, Navy and the Air force. The Defence Ministry is unhappy over the fact that Staff Officer of the Commandant of the prestigious National Defence Academy was allegedly involved in the recruitment scam and may seek a detailed report from the IDS in this regard, sources said here. The Colonel is posted as staff officer to commandant of National Defence Academy, Lt Gen Jatinder Singh. They said IDS Chief Vice Admiral Shekhar Sinha had also met Defence Minister AK Antony in his office today. Another key officer of the National Defence Academy, Suhas Shankar Waghmare, was arrested by CBI on Monday night over allegations that he had taken money from over 15 candidates in the alleged recruitment scam.